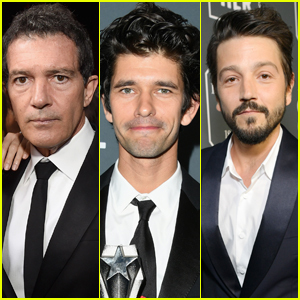 Antonio Banderas, Ben Whishaw and Diego Luna are looking sharp! The three stars were all in attendance at the 2019 Critics’ Choice Awards on Sunday (January 13) at the Barker Hangar in Santa Monica, Calif.
Antonio was nominated for Best Actor in a Movie/Limited Series, Ben was nominated for Best Supporting Actor in a Movie/Limited Series (and won!) and Diego was nominated for Best Actor in a Drama Series. Antonio posed with girlfriend Nicole Kimpel inside the event. Best Supporting Actor in a drama series nominee Matthew Macfadyen, Best Actor nominee Willem Dafoe and Spider-Man: Into the Spider-Verse‘s Shameik Moore were all in attendance at the event. FYI: Diego is wearing a Prada tux. Ben is wearing an Alexander McQueen tux. Willem is wearing a Prada tux. Jason Bateman and Antonio Banderas are looking dapper at the 2018 Emmy Awards held at the Microsoft Theater on Monday (September 17) in Los Angeles. 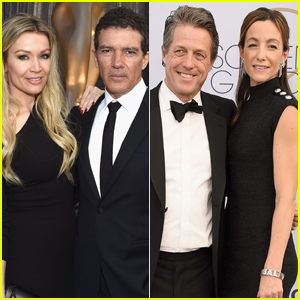 Jason was joined by his wife Amanda Anka, and Antonio brought along his girlfriend Nicole Kimpel. Nominees Larry David, Ted Danson, Louie Anderson, and Michael Stuhlbarg were also in attendance. Jason is up for Outstanding Lead Actor in a Drama Series for his work as Marty Byrde on Netflix’s Ozark (episode: “The Toll”), as well as Outstanding Directing for a Drama Series (episode: “The Toll”). Antonio is nominated for Outstanding Lead Actor in a Limited Series or Movie for his role as Pablo Picasso on National Geographic’s Genius: Picasso. FYI: Jason is wearing Dior Men. Antonio is wearing Emporio Armani. Michael is wearing Giorgio Armani. Antonio Banderas is dapper in a suit while posing alongside his girlfriend Nicole Kimpel at the Antonio Banderas’s Fragances 20th Anniversary Celebration held on Saturday (July 7) in Marbella, Spain. The 57-year-old actor and his 37-year-old girlfriend were joined at the event by Olga Kurylenko and Paz Vega, who came out to show their support.